German inflation trends have flattened out despite what has been a period of rapid increases in the oil price. Ex-energy inflation is flat and very mild while the headline PPI shows some of the impact of sharply rising oil prices (see Chart on right for a tracking of Brent oil vs. the German PPI). Inflation trends are now mixed and contrary. The headline PPI has accelerated from 2.4% over 12 months to a pace of 3.1% over three months and six months. The PPI excluding energy, meanwhile, is in full deceleration mode with inflation dropping from 2.1% over 12 months to 1.7% over six months to 1.5% over three months. The CPI and CPI excluding energy both are trendless with inflation in a 1.6% to 2.2% habitat for the headline and the core for horizons spanning 12 months and three months. Each of these price series shows a hint of acceleration because, for each, the three-month pace is above the 12-month pace. In the quarter-to-date, the divisions are stark. 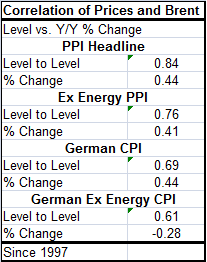 The PPI headline is up at a 3.3% pace with the ex-energy reading at 1.6%. The CPI has a 1.7% pace with the ex-energy reading at 1.3%. In both cases, inflation measures excluding energy are significantly lower. But this is about history: what should we expect ahead? The correlation table below shows some interesting and curious results. Looking at the headline PPI, ex-energy PPI, CPI and ex-energy CPI, in all cases the headline has the higher correlation with Brent either in price level terms or looking at year-on-year changes. Price levels correlate higher to Brent than do year-on-year price changes. That might indicate some slipperiness or inconsistency in the pace of the inflation pass-through speeds from oil to consumer or producer prices. A lot of it is simply the impact of a correlation bias because prices grow over time while inflation doesn't (hopefully). The ex-energy PPI and headline CPI have almost the same correlation to Brent. But what is odd and most interesting is the negative correlation of the ex-energy German CPI to Brent even though the price levels correlate well. The reason for this unexpected peculiarity is that so many oil prices spikes correlate with German economic downturns. And when the German economy turns lower, the CPI is damped and it slows creating a negative correlation to rising oil prices. The impact of the German downturn on the German ex-energy price level comes first and hits much harder than it hits Brent.